« Why do we like to point out other people’s mistakes? 5. Adjust your goals and dreams as life changes. – A great deal of pain in life comes from having a specific dream that you’ve fallen in love with, and when it doesn’t work out exactly as planned, you become angry that you now have to pursue a different path. If you want to tame your inner demons and make the most of life, you must not become rigidly attached to just one specific dream, and remain open to there being an even better, equally as happy path ahead. Life is unpredictable, but it provides plenty of opportunities to make dreams come true. Just don’t forget that sometimes taking a positive step forward requires you to slightly adjust your dreams, or plan new ones – it’s OK to change your mind or have more than one dream. Editors note: I originally chose #10 but changed after re-reading the Power of Negative Thinking (below). 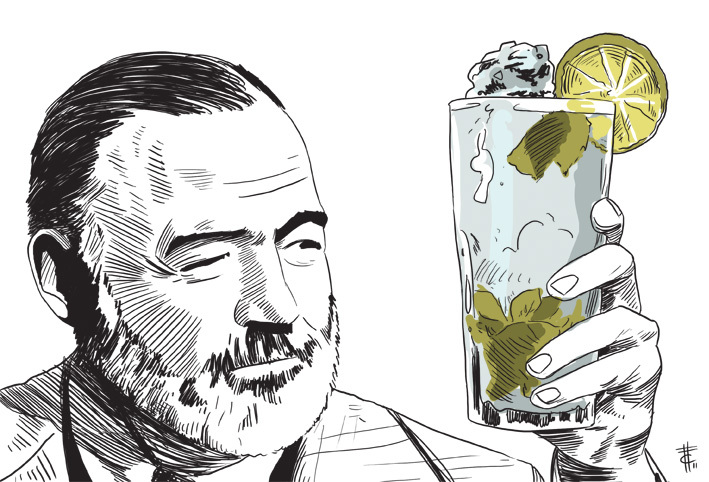 Read this because: There’s nothing that makes you feel like a literary legend like Ernest Hemingway and refreshed like a sprig of the freshest mint crushed into your rum. Plus, it’s incredible fun to shout loudly in a bar with your best friend from high school (“Mo-heee!-to!”). But did you know that bartenders everywhere have a vast hatred against this drink? According to the Atlantic Wire, it’s true. And while reading this article makes me want to weep, after hosting a party where the signature drink was hand-shaken (not stirred) mojitos, I can solemnly agree. The mojito, as wonderful and amazing of a drink that it is, is an outcast. If you are lucky enough to be at a bar where mojitos are on the menu and made for you with pride, enjoy it, for your fellow countrymen may not be as lucky. Read this because: The very concept is baffling. If you want something, shouldn’t you exercise positive visualization? Yes, except that in some situations, visualizing that you achieve a goal may make you feel as though you’ve already achieved it and therefore will be less likely to actually do it. Ancient philosophers and spiritual teachers understood the need to balance the positive with the negative, optimism with pessimism, a striving for success and security with an openness to failure and uncertainty. The Stoics recommended “the premeditation of evils,” or deliberately visualizing the worst-case scenario. This tends to reduce anxiety about the future: when you soberly picture how badly things could go in reality, you usually conclude that you could cope. Besides, they noted, imagining that you might lose the relationships and possessions you currently enjoy increases your gratitude for having them now. Positive thinking, by contrast, always leans into the future, ignoring present pleasures. If you want something really, really badly, think about the exact opposite and then work hard towards doing everything you can to not make it happen. But when it comes to something like your relationship, thinking that you and your partner are amazing, strong, and solid may lead you to stop working on it and cause you to miss something huge that could bring about it’s demise. Whereas if you are think about your relationship falling apart (and that’s not what you want), then you will work hard to make sure that it does not. Okay, I think I understand it now. This entry was posted on Sunday, August 12th, 2012 at 3:45 pm and is filed under on reading. You can follow any responses to this entry through the RSS 2.0 feed. You can leave a response, or trackback from your own site.